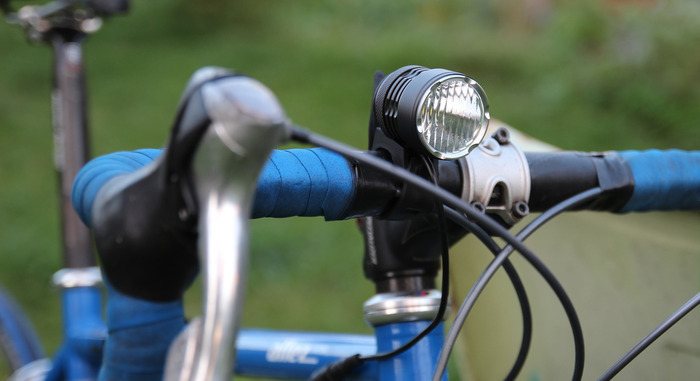 Kickstarter is littered with innovative bicycle light solutions. Last time I took a look at the Radlight and was not impressed at all. The Xlerad light on the handlebar of a racing bike. "We were fed up with the shortcomings of mainstream battery lights such as low battery life, redundant and useless modes and the need to constantly take our hands of the handlebar to adjust the light." The solution they came up with is an "intelligent" bicycle light that adjust the brightness depending on the speed you are traveling. Because when you go faster you need to be able to look ahead further. When you go slower the light can save energy so that the battery lasts slightly longer. The variable brightness is quite similar to the good old lights powered by a dynamo. They would light up more as you go faster and produce more power. In fact a hub generator would solve all of the issues stated by the makers: It's a hassle free light that automatically turns on when you ride, gets brighter as you go faster and as a bonus does not ever need recharging. The only downside is the increased resistance in the front wheel, but with modern generator hubs this is almost negligible, if want less hassle, this can hardly be a concern. That is why millions of cyclists around the world use generator hubs and don't ever worry about their lights working. The Xlerad has no buttons, but you need to tap the light, and even though the makers say they don't like useless modes they have included a blinking and fixed mode. Simply touching the light anywhere will switch modes. I fail to see how this is better than a good old button, and can see potential annoyances with accidentally tapping it when not intended. The blinking mode is also contradictory to "no useless modes" statement we heard earlier. The makers state that the Xlerad is "safer" than mainstream bicycle lights. This is quite a bold claim that is quite hard to prove, but they don't even try. There is absolutely no evidence that the Xlerad is safer than any other bicycle light by any standard. "We knew that we could make a safer, more autonomous way of traveling at night on a bicycle." A brighter light does not mean a safer ride. In fact for most urban use a light is hardly needed to see ahead. The bicycles in the pictures and video on the Kickstarter page are clearly intended for normal use (and not stripped down for the video), yet lack any reflectors or a rear light. The only appeal for this light I can imagine would be for mountain bikers who go into the woods at night without any other illumination. But with a battery life of somewhere between 3.7 and 45 hours in smart mode you never know when the battery will run out, so you better recharge it for every ride anyway. With a light output of up to 1000 lumens it should be bright enough for any situation, but there are other lights on the market with a similar output. If you are fed up with low battery life, useless mode and constantly adjusting your bicycle light I would suggest a generator hub for your front wheel and a decent light to go with it, it will cost you less money and you will never have the hassle of changing batteries again. 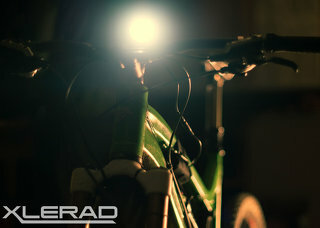 The Xlerad lit up on a mountain bike in darkness. Update: The Magnic Light is also an excellent choice for a light that has no useless modes and never runs out of batteries. 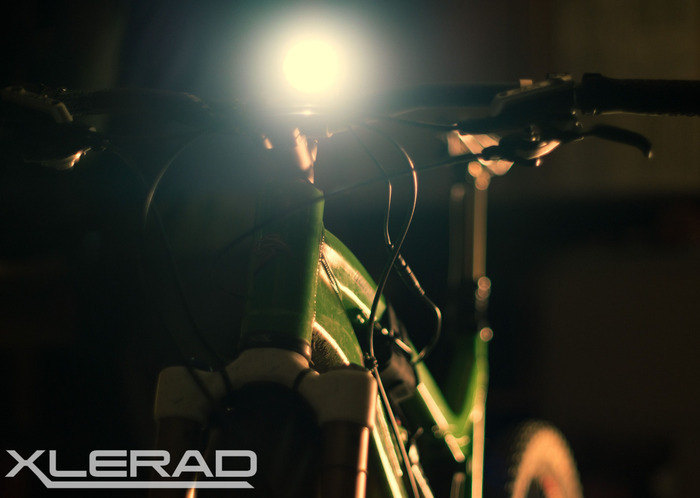 The Xlerad is very similar to many existing mountain bike lights, but the automatic brightness adjustment could help keeping the light on longer, but so can bringing an extra battery. The makers should stay away from making claims about safety, which are hard to take serious. I have the impression that the makers of this light have never seen a city bicycle. The product is clearly aimed at sports bicycles and is inferior to existing products for city bicycles when it comes to ease of use.